Most lupines are perennial flowers, though there annual varieties that require yearly replanting. Even annual lupines readily self-seed in the garden, giving the impression that they are perennial since they return each year from the seed they have shed. While a new bed of lupine can be started by direct seeding, starting the seeds indoors or purchasing nursery seedlings ensures that enough plants reach maturity to fill in your garden. Purchase or start seeds in peat pots, as lupine roots do not tolerate being disturbed and peat pots limit the disturbance of transplanting. Set the lupine outside in an area protected from wind and sun one week prior to transplanting. Leave the plants outside during the daytime and bring them in at night. Gradually move them into direct sunlight over the course of the week so the plants become accustomed to outdoor conditions. Prepare the garden bed for transplanting. Lay a 2-inch layer of compost over a bed that receives full sunlight. Till the compost into the top 10 inches of soil to aid drainage and add nutrition. Dig planting holes as deep as and slightly wider than the peat pots the lupine is in. Space the planting holes 18 inches apart in all directions. Tear off the top of the peat pot so that the rim of the pot is now even with the soil surface in the pot. Set the pot in the planting hole so that the rim of the pot sits even with the soil surface. Fill in around the pot with soil, but do not cover the soil inside the pot. Water the garden bed thoroughly immediately after planting, then continue to keep it moist but not soggy thereafter. The peat pot breaks down in the soil so that the lupine can spread its roots freely in the garden. Some lupine varieties are more frost tolerant than others. Check the seed packet or plant label for the best time to transplant, as it depends on lupine variety whether the best planting time is in mid-spring or early summer. 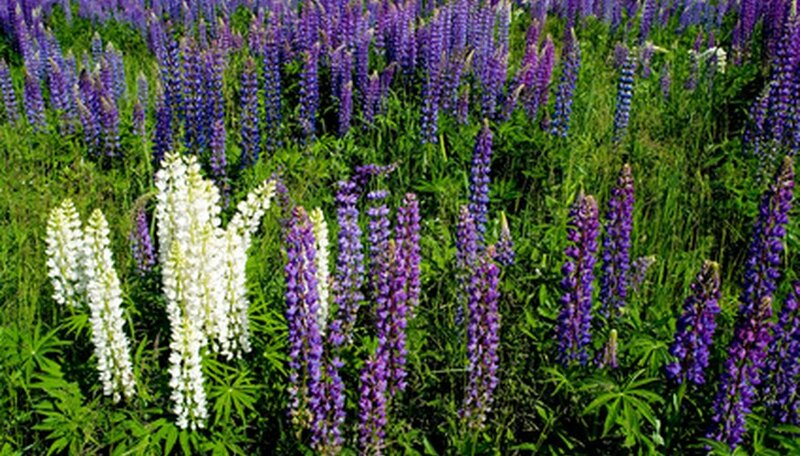 Lupine transplants are sometimes sold in plastic pots, but these may not transplant well. Lupine has a long taproot that easily breaks during transplanting, which is why plantable peat pots are preferred.